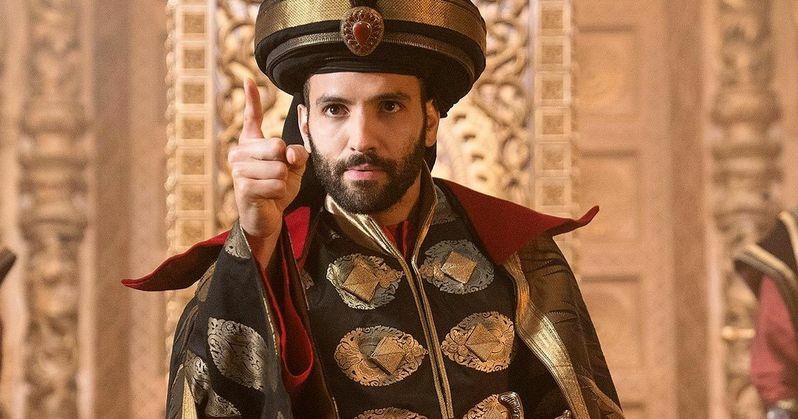 The latest TV spot for Disney's live-action adaptation of Aladdin features a new look at the villainous Jafar and his magic. We just received a new full-length trailer for the movie and the new TV spot uses a lot of the same footage to hint at some of the iconic scenes and songs from the original done in a live-action and CGI hybrid. Will Smith's Genie is back and he looks very much like the same guy that has been freaking some Disney fans out. It definitely looks like Jafar is going to be a tough opponent when Aladdin hits theaters in May of this year. The TV spot features a brief shot of the villain wielding some mysterious magic that looks like it may rival the power of the Genie. Getting three wishes from a magical and all powerful Genie is not going to be as easy as it sounds, but we already knew that, thanks to the original animated version of the story, which the live-action tale is directly based on. As for recreating some of the most famous scenes from the Disney animated movie, Aladdin may come under fire for doing so, much like the "live-action" version of The Lion King. While it is cool to see, many fans are hoping for a deviation from the animated source material as a way to distance itself and be its own thing. Additionally, some of the original animators and writers claim that they are not being compensated for their work when it appears in a new live-action movie that is taking a few pieces of their original idea and adding it in nearly shot-for-shot. Taking such iconic source material and trying to remake it is not an easy thing to do. The chips are going to be stacked up against Disney for even attempting it, but it seems that a backlash has already started, which is somewhat understandable since they are releasing three live-action remakes this year alone. Dumbo comes first, then Aladdin, and finally The Lion King. Each movie is guaranteed to make a killing at the box office, but is it too much too soon? We'll just have to wait and see where Disney fans are when The Lion King opens this summer. Will Smith's take on Genie has undoubtedly taken over any controversy that the Aladdin remake might have already had. Fans of the original are still tripping out on how he looks and sounds. With that being said, nobody can take over and replace what Robin Williams did with the character, and Smith knows that. That is why he had decided to do his own thing with the Genie, which is wise. While we wait to see some more footage from the upcoming live-action Aladdin remake, you can check out the latest TV spot below, thanks to Disney.